Barton's Delihah wins tops youth award. A Supreme Champion Cow of the Junior Show has been selected at World Dairy Expo since 1994. But, 2018 marks the first time for a Supreme Champion heifer. The Brown Swiss Grand Champion was a repeat winner from last year. Cutting Edge T Delilah, exhibited by Kyle Barton, Copake, N.Y., was the winning five-year-old. She was the committee’s selection for Supreme Champion of this year’s Junior Show. Gamlake Destry Sallie took home Reserve Supreme honors. She was the winning Holstein Aged Cow and the Best Bred and Owned, in addition to Grand Champion Holstein of the Junior Show. Sallie is bred and owned by Samantha Gambonini of Petaluma, Calif. The other contenders . . . . In the Junior Ayrshire Show, Grand Champion was Toppglen Wishful Thinking-ET, exhibited by Tanner, Brennan, Marissa, and Logan Topp of New Bremen, Ohio. Grand Champion of the Junior Guernsey Show honors went to the Junior Three-Year-Old, Hi Guern View Diva Designer, shown by Riley Zettle of Rock City, Ill. 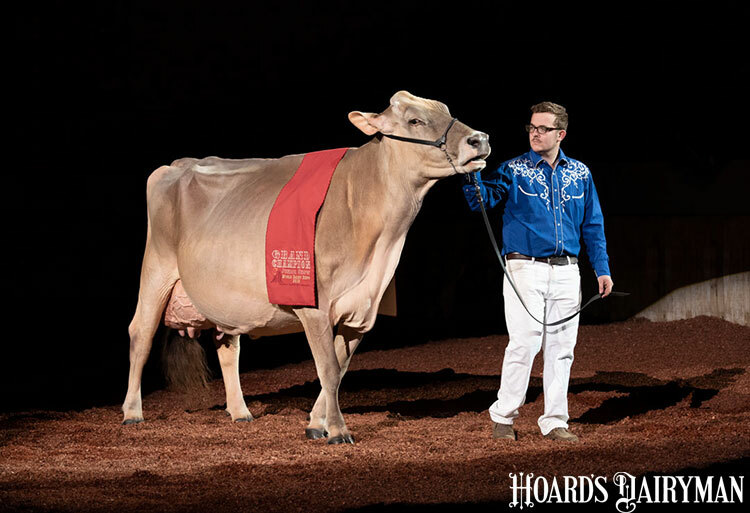 In the Junior Jersey Show, SV Impression Holly-ET was Grand Champion. 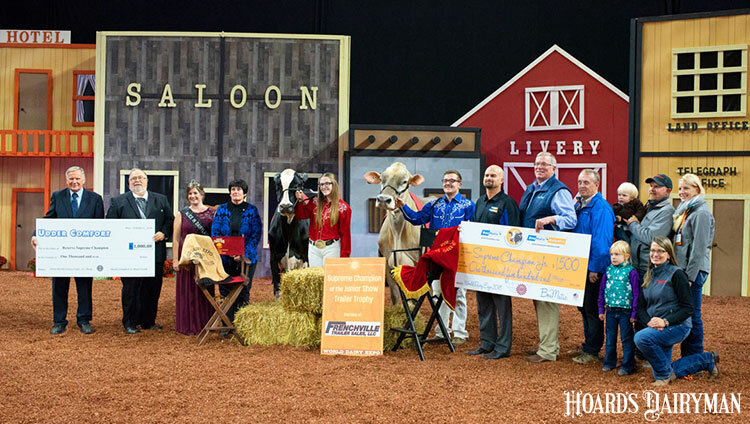 The 5-year-old cow was exhibited by Ben, Andy, Blessing, and Grace Sauder of River Valley Farm from Tremont, Ill. Grace Sauder led Holly in the Supreme Parade of Champions. Three-time Milking Shorthorn Grand Champion, Maple Fudge of 12 Oaks, is owned by siblings Colton and Ashley Brandel of Lake Mills, Wis. Ashley Brandel was at the halter of Fudge again this year. In the Junior Red and White Show, Grand Champion honors went to Robin-Hood Pretty In-Red. This 4-year-old was exhibited by Regan Demmer of Peosta, Iowa. For the first time, the W. Terry Howard Trophy was presented. The Supreme Junior Champion went to the Red and White. The fall calf, Ms Kress-Hil Saphire-Red-ET. Saphire is owned by Owen and Kendyll Kress and Savanah Barts, Newton, Wis. The Reserve Supreme Champion went to the Junior Champion Ayrshire, Four-Hills Burd Sassy 64671, exhibited by Jonathan Hill of Bristol, Vt. The others in contention . . .
ShowSniders HP GG Lonestar Amazing-ETV, led by Logan Harbaugh and owned by the Amazing Syndicate of Marion, Wis., was Junior Champion of the Junior Guernsey Show. Siblings Kaelyn, Kenadee, and Keegan Weigel of Platteville, Wis., claimed the Junior Champion of the Holstein Show with their winter yearling, Budjon-Abbott Alexandra-ET. Junior Champion of the Milking Shorthron Show went to the first-place fall yearling, KnH Endres Zeus Legendary, shown by Mikayla Endres from Lone Rock, Wis.
Meadowridge Fizz Sparkle was named Junior Champion of the Junior Jersey Show. This winter yearling was owned by Cole Kruse and Gene Henderson of Dyersville, Iowa. Junior Champion of the Junior Brown Swiss Show went to Silver Top Allstar Trick, exhibited by Shelby Biasini and owned by Silver Top Swiss of Morrisville, Vt.